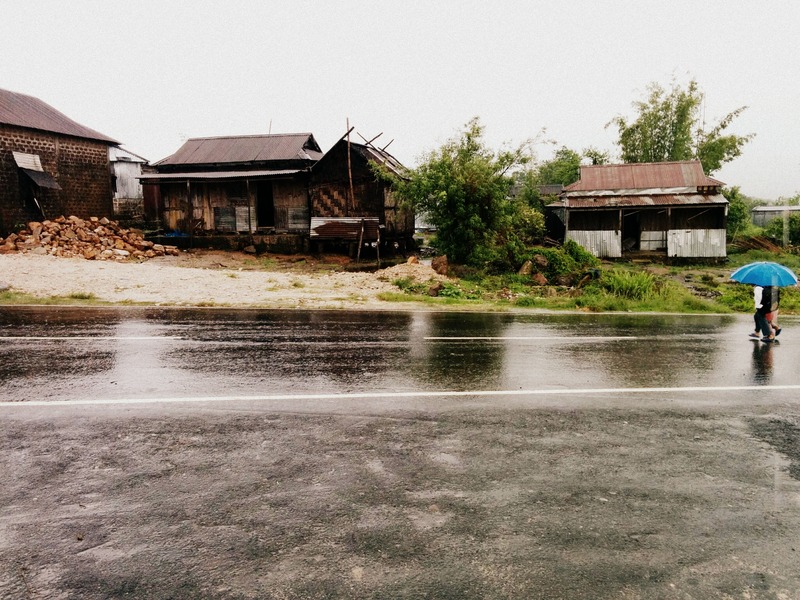 Exploring the North-east (Meghalaya and Assam) – Exploring Life..
We left to airport anticipating a crazy week .That was the first time we girls had planned a trip for 9 days. Two months back a friend suggested we go to Meghalaya and we booked our tickets a week after that without giving much thought. It’s exciting to give into impulses when you plan to travel — even if it sometimes means taking a hit to the wallet 😉 Its only then we come away with some of the best stories and memories. Two of my friends (to whom I am grateful for) had planned where to stay and made all the arrangements before we left :P. We (5 of us) arrived at Guwahati from different parts of India ( ie Bombay, Baroda and Bangalore) . We were welcomed by the news of earthquakes hitting northern part of India and Nepal. We even felt tremors in the airport which did not stop us from continuing our trip (luckily the quake did not strike the north-eastern parts). Where we stayed: We stayed at the GREEN VILLAGE RESORT (9830014665). A beautiful hotel with a fitting ambience –The stair railing and walls made of bamboo and a pond amidst the huts. We were pretty much the visitors there and it felt like a personalised resort 😀 . We had a cosy stay there that night. The Khaziranga national Park is open daily from 1st November to 30th April i.e., for 6 (six) months only (so beware not to show up when the park is closed). The next day started early at 5:30 when we left for the Elephant safari in the national park. 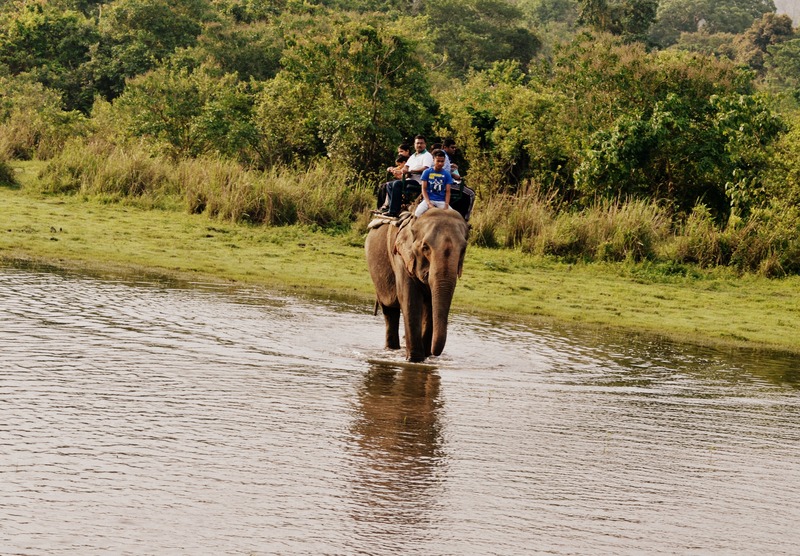 The elephants crossed a pond of water and took us deeper into the sanctuary. 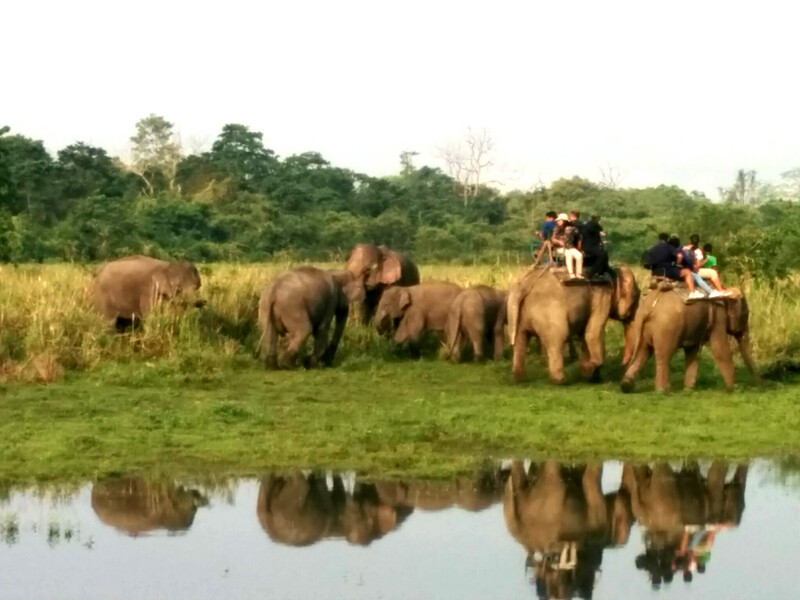 The elephants were trained to spot Rhinos amidst the tall grasses and take us closer to them so we can click pictures of the Rhinos and take selfies with them. 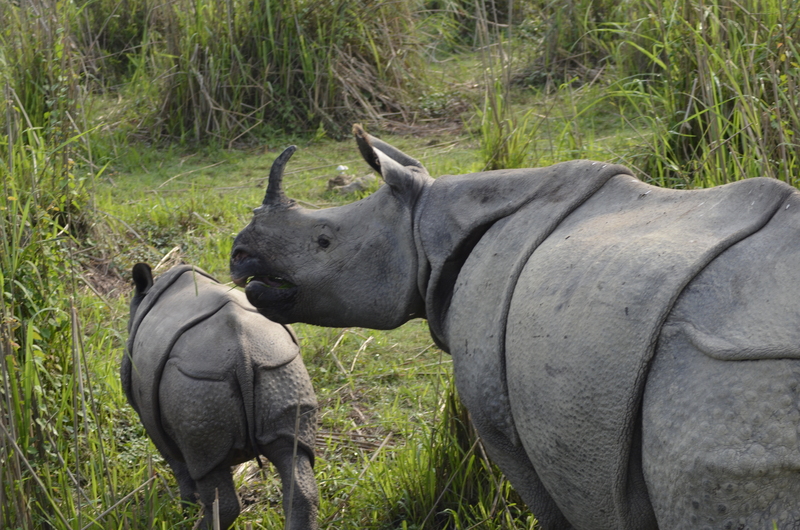 We had a surprise package waiting for us – A baby rhino strolling alongside its mother. We managed to get really good pictures of the Rhinos since we had a DSLR and wildlife photography lens. We spotted 5 Rhinos and were delighted at the sight of the endangered animal..
We spent our afternoon on a Jeep ride through the forest. It was an open jeep soiled on the sides which was typical of a jeep used for forest rides. We gazed at the flora and spotted some rhinos, deer and migratory birds. 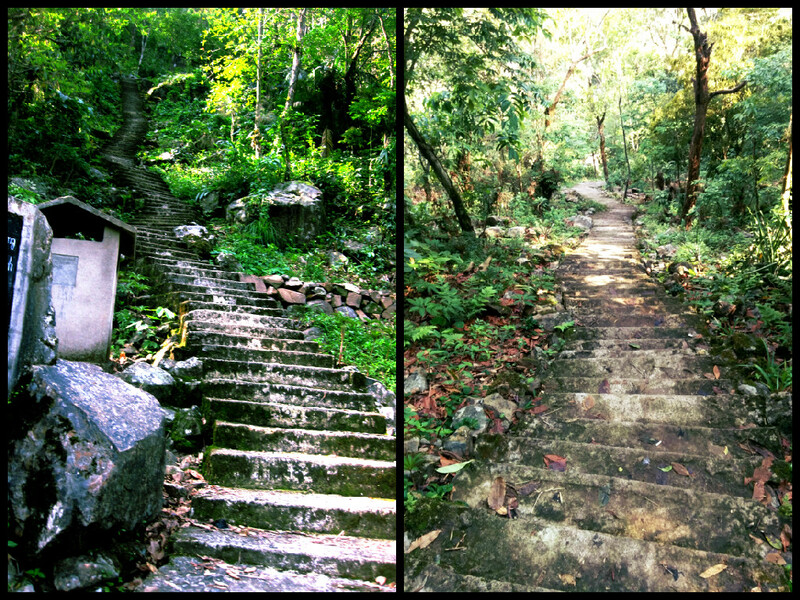 It was a tiring shaky ride but worth the pain. We left Assam and headed towards Meghalaya. As we entered Megahlaya we were struck by the scenic beauty; Expanse of tropical mixed vegetation and pine trees with a fusion of lush green and wilted auburn; the charming bamboo huts made the landscape remarkable. Meghalaya is truly the Scotland of India. We were soon uphill heading towards Jaintia hills. Where we stayed: We stayed at CTC ORDCHID INN. 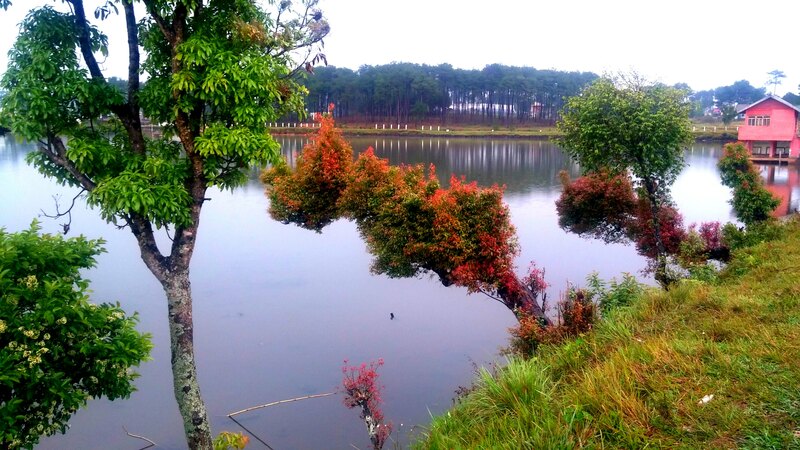 A resort facing the lake which makes it convenient to walk around and chill out at the lake in evening . Jaintia hills line the eastern part of Meghalaya. We arrived at the City Jowai in the west jaintia hills district. It is not a famous tourist spot but a place to explore. We wanted to see the monoliths at Nartiang and toured all through the place in search of it (locals are not so good with directions , you can trust your google maps better), risked ourselves by taking a broken mud bridge just to find out we took a wrong turn and ended up riding 60 kms extra –to and fro. We reached the monoliths finally. Monolith collection stands the tallest Menhir erected by U Mar Phalyngki a trusted lieutenant of the Jaintia King to commemorate his victory in battle.. 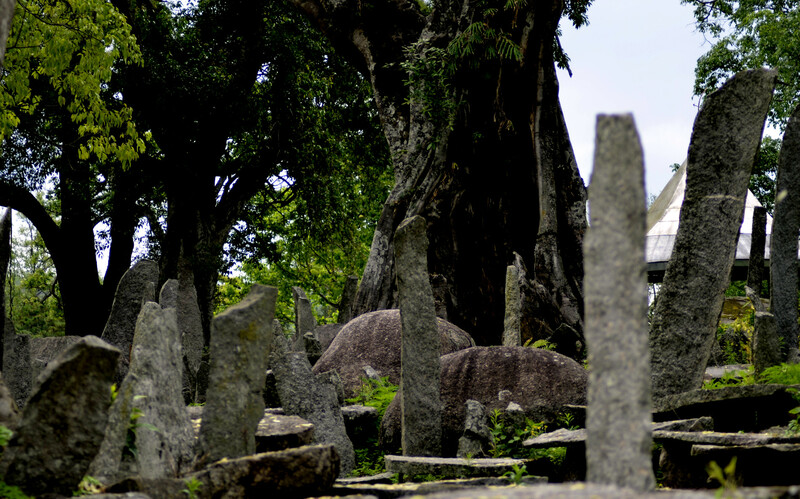 These consists of Menhirs (Upright stones) Moo Shynrang and Dolmens (flat stones in the horizontal position) locally known as Moo Kynthai. We walked around the lake in the evening to calm ourselves down. We went in search of sindhia caves early next morning but could not find it at all. After 2 hours of searching , asking locals for the way and receiving a blank stare we gave up. We headed uphill to Mawlynnong. 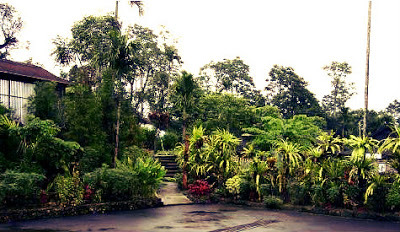 We headed east towards Mawlynnong village referred to as ‘God’s own garden’ .It has won the acclaim of being the cleanest village in Asia. 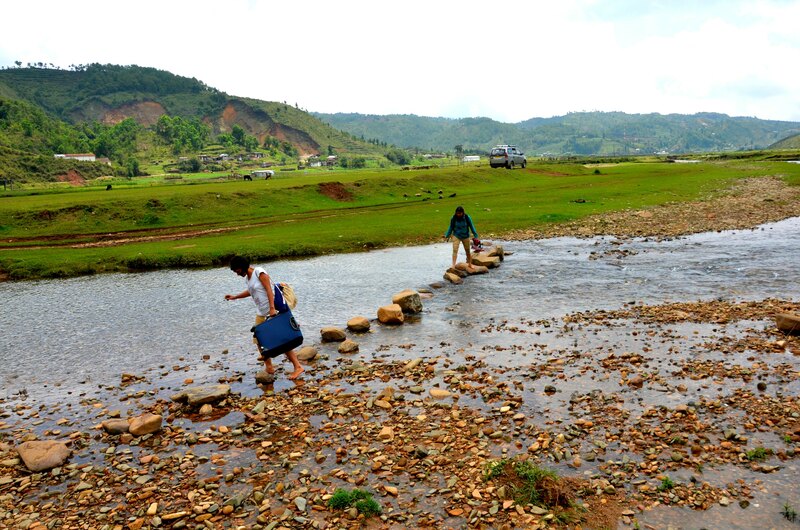 It is located about 90 km from Shillong in the east khasi hills.We crossed to Bangladesh border checkpost and travelled a really long long distance to reach the village. We were endlessly climbing a hill which had no signboard or milestones on the whereabouts of the village.Six hours of travel we had to undertake. It felt to going to Shangrila ‘ a mystical land on top of the mountain where we get everything you need and no one grows old’. When we arrived at the village we were exhausted but our spirits went high from the sight of the village itself. It was a fairy land with cute houses made of wooden logs and bamboo fences, nicely painted, the courtyards are full of blooming flowers. 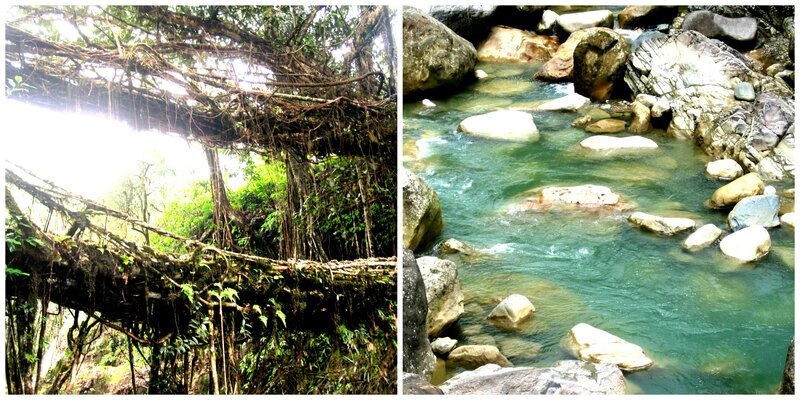 We visited the living root bridge which happened to be the star attraction of the place. A root which tangled across a thin strip of stone bridge which made it look stunning above the stream of water which then ended its course in a fall. Then we went to a 80 feet high “machan’ or observatory made of bamboo shoots. 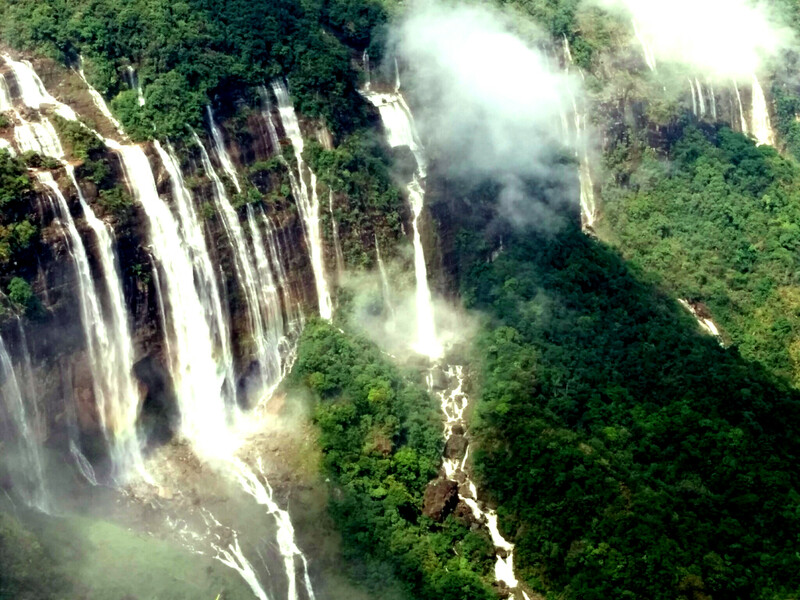 An opportunity to view natural beauty in abundance from the Sky. It was frightening to climb as the entire structure (80 feet tall) was made of bamboo and was tied to a tree for support. We managed to reach the top and viewed Bangladesh. Where we stayed: We stayed at a guesthouse ‘Haythrong’. (Deepak Laloo or Carol Nongrum (0364-2502420, 09863115302)).The host (a guy) was very cute with a british accent 😛 . Would totally recommend this place for couples – it has a beautiful tree house with a bridge from room facing the forest and stream running below it – such a lovey-dovey place. The village after acquiring its cleanest village status has become commercialised. People ask money for village maintenance and food is charged at 100 per person -whatever you eat. . We regret having slept off the entire day due to the exhaustion and not roaming the village. Where we stayed:We stayed at SA-I-MIKA RESORT(9863020718) which happened to be located in the middle of nowhere (Low hillocks everywhere around the place) ; Later we realised all the places here were like that .The cottage people gave us a warm welcome by providing hot pakodas. We were all drenched by the time we were inside the reception which was an adorable room build of stones stacked as walls. There was slow jazz music playing and a drum kept. We played the drums and started dancing like crazy. We got contemporary Khasi cottage with stone walls and thatched roofs. 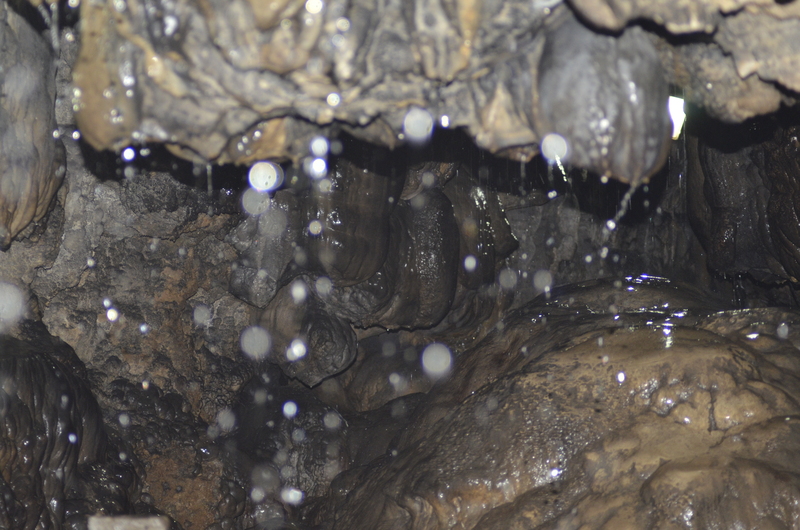 We left our luggage and went to Mawsmi caves – it even rains inside the cave here. We traversed the cave with an umbrella. Then we arrived at the Seven sister falls view point which was pleasing. We then went to Nohkalikai falls view point (by now we were bored of waterfalls). Pure honey is sold here which is supposedly special. 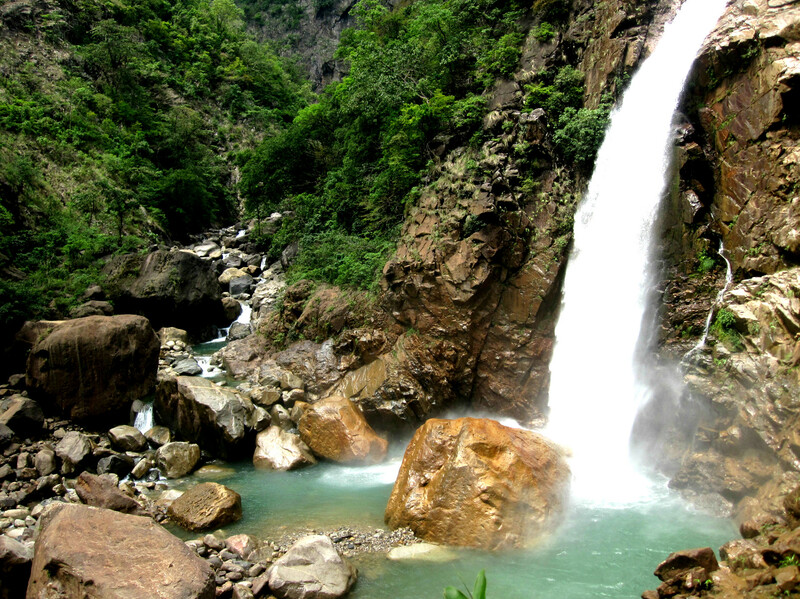 “ You go to nongriat for the Trek, waterfall and living root bridge. There is a Double decker living root bridge down the valley which has 2000 steps descending to it. It takes one and half hour to reach the bridge. A weird guide had come along whose name was ‘Paradise’. He had streaked hair, long nails painted black and chewing beetlenuts. He took us through the forest to the living root bridge. Where we stayed:There we stayed at the ‘Serene Home stay’ (8575287156). This is the Nongriat story for you (Thanks Shivangi). We at cherrapunjee ventured to the Arva Caves. 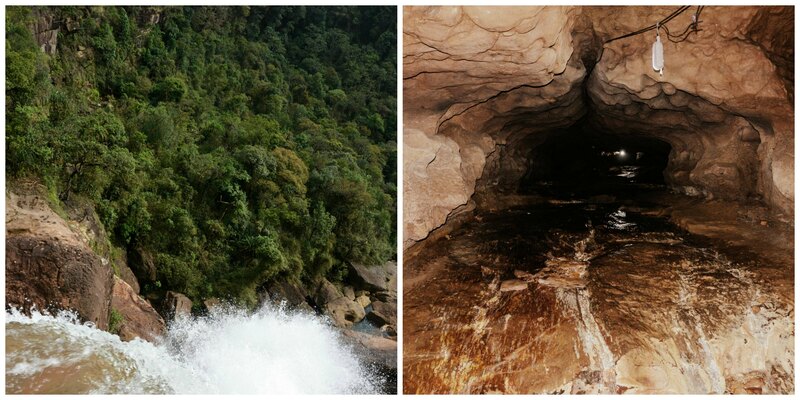 It was astounding – a limestone cave with a water stream flowing inside .It was both eerie and intriguing. We then went to the starting point of Bethlam falls.There was a beautiful river flowing, cutting across boulders, and finally emptying itself into the valley. We could go near the starting point and see the water falling which was exciting. Where we stayed:The one reason to visit this place is for the ‘ Maple pine farms’ (James-9856041205) .It is a cottage built by a Canadian guy which is picturesque. The place is in a valley surrounded by mountains. It had a brook passing by and we have to cross the stream of water to get to this place (there is no other way to this place). We travelled to the village which had one attraction that was the Sacred forests. They were the forests where Khasis did their prayers and sacrifices. We found moss laden floor and trees;the bark had turned green giving the entire forest a green glow . We observed the orchid pines and rhododrendrons . We should not take anything out of the sacred forest so we did not pick any sample. We were very hungry by the time we came out of the forest so we decided to search for places to eat .To our dismay we found none and it started raining heavily. We finally went to a shady hotel named ‘ Fast food available’ in a tin sheet. We ate maggi there and returned back to the place we were staying. 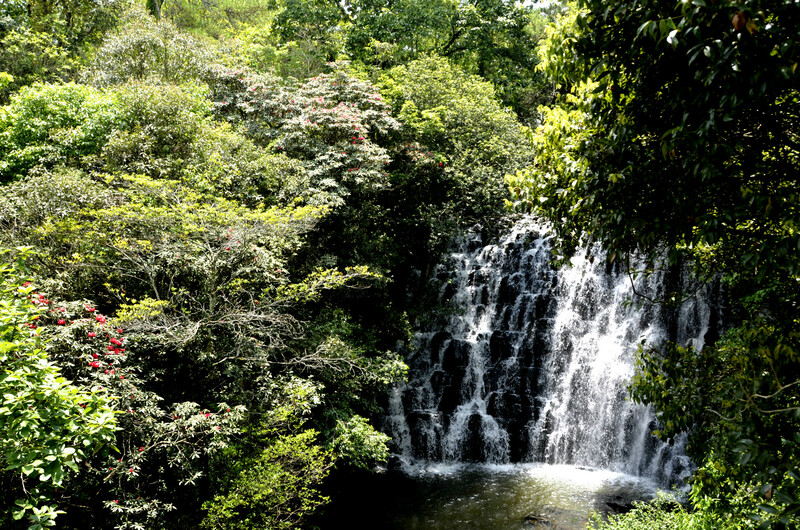 We visited the Elephant falls on our way to shillong. The falls was just another falls we see in Meghalaya.There was Khasi outfits and we tried them on and danced and clicked pics in it. We left to Shillong- Finally we felt the buzz of the city life. Where we stayed:We stayed at the AERODENE COTTAGE (9774065366) which had a beautiful room but kind of overpriced (5k per night). You can try at some bread and breakfast places which can be cheaper and convenient if you book early . To describe Shillong in one word ‘ Swag ’. You will see fashionable clothes being worn , a marked difference from the villages around. Shillong is called the “Rock capital of India” but unluckily we were not able to find any rock concert at when we were there. There is the police Bazaar for shopping. It was refreshing to see Pizza huts and subways again after what felt like an eternity. We took some souvenirs for our dear ones and ate at the Delhi dhaba. I wanted to try the Khasi food to went to this Khasi place which served Jod ah (Rice cooked in fat and served with pork) and fermented beans. We also tried their fish and chilly pickle. All their foods are cooked in pork fat and oil which makes it heavy. It was ‘different’ . 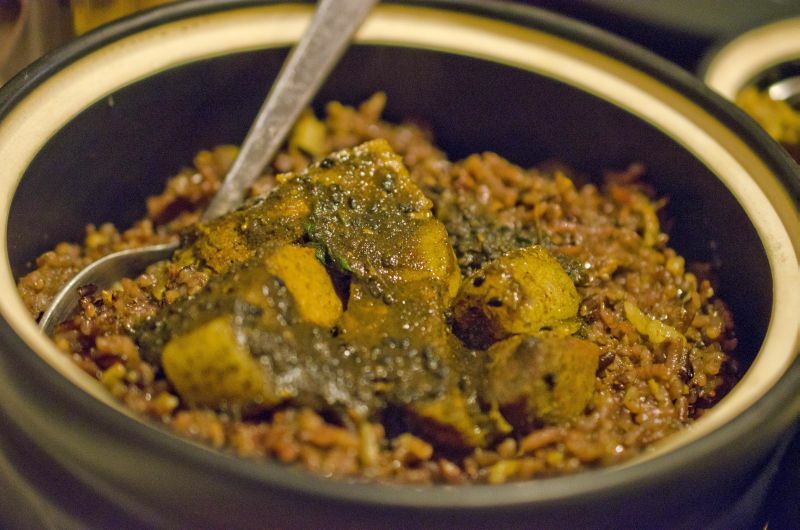 You should definitely try the Khasi food if you are a non vegetarian for the flavour of the local cuisine. We read that bamboo shoots are the delicacies here but seldom did anyone know what they were.We were disappointed because of this. You can lucky if you can find a place which sells this. Wai Wai is the brand of noodles that is famous here. It is same as magi but a little burnt. In most villages people eat rice, dal and potatos. We left to Guwahati early in the morning. We went to the “Bramaputra river” called the river of sorrow. We sat at the park facing the expanse of the river. We were too tired to do anything. We left to our airport and boarded our long two stop flights which was delayed by 2 hours and we ended up reaching home at 1AM. Nonetheless we were happy we reached home sweet home. The 9 day long trip came to an end We were glad we reached back safe. How we managed the travel: We hired a Xylo and a driver. He was with us for all the 9 days and we arranged for his stay too. This helped us make our journey more personalised in terms of places we wanted to go. Boarding and Lodging : We had called and made reservations , wherever possible made payment to confirm our bookings. If you want it cheap , you should go for home stays which will charge you 1-2 K per night. Cottages and Resorts can range between 3-5 K per night . We stayed in homestays, cottages, resort and a tent. 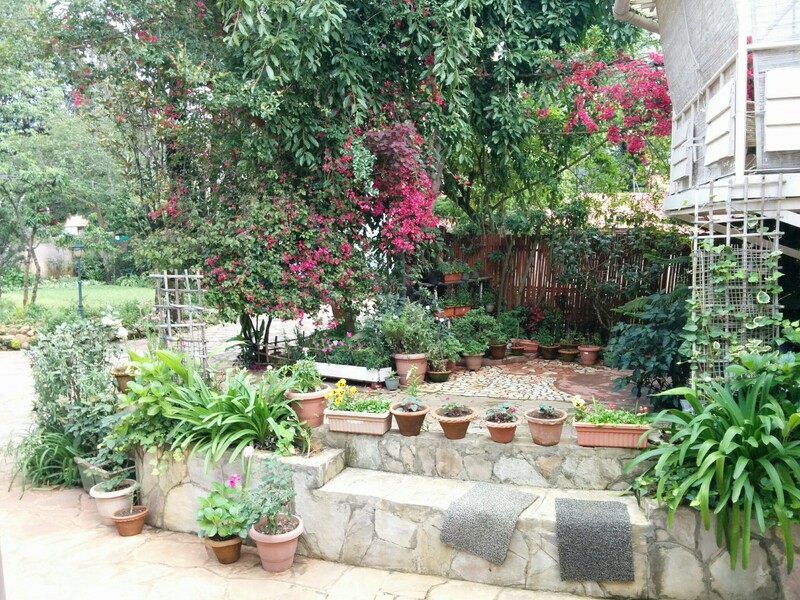 If you are travelling with friends and want a low budget stay prefer homestays or tents. 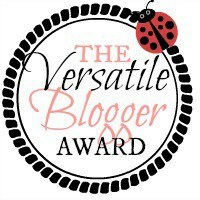 awesome blog lalitha….refreshed memories….!! !…Too good…. Glad you enjoyed it 😀 Yes we had one hell of a trip!